Se lille film her der prøver at viser hvor stort et område der nu er kortlagt… Og altså med kortlagt så er det ikke hele sandheden, det som projektet har gjort er at sætte en mia stjerner i et katalog som dem de vil gennemføre en nærmere undersøgelse af. Og af dem er de så allerede efter de første tre år i rummet i mål med de første mange mio.. Andel af rummet der afsøges svare sådan nogenlunde til en sjettedel af mælkevejen, MEN altså den mia. stjerner som man nu vil følge gennem de kommende år er i teorien kun en procent af Mælkevejens stjerner. Den særlige grund til at fremhæve dette projekt er at det handler om en systematisk indsamling af data, og ikke en eller anden teoretisk tilgang. Dette datasæt vil give reel viden og indsigt og ovenpå denne opmåling af verden vil man kunne udvikle simuleringer, og ovenpå dette kan man afprøve teorier. Det er denne grundlige og ekstremt tidskrævende systematiske tilgang der er den eneste løsning på forståelsen af universet. Men nogle gange slet ikke vinder fremme i dagens politiske miljø, hvor tid er alt, og hvor mere eller mindre religiøse forestillinger dominere tænkningen blandt ledende lag i samfundet. Opdatering april 2018: nyt stjernekort er udgivet med mange flere detaljer. 14 September 2016The first catalogue of more than a billion stars from ESA’s Gaia satellite was published today – the largest all-sky survey of celestial objects to date. As a taster of the richer catalogue to come in the near future, today’s release also features the distances and the motions across the sky for more than two million stars. “Gaia is at the forefront of astrometry, charting the sky at precisions that have never been achieved before,” says Alvaro Giménez, ESA’s Director of Science. Launched 1000 days ago, Gaia started its scientific work in July 2014. 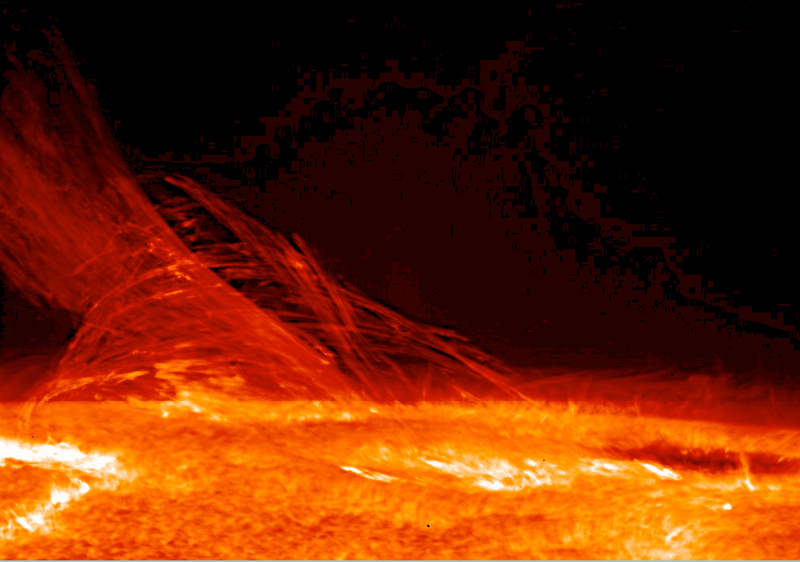 This first release is based on data collected during its first 14 months of scanning the sky, up to September 2015. 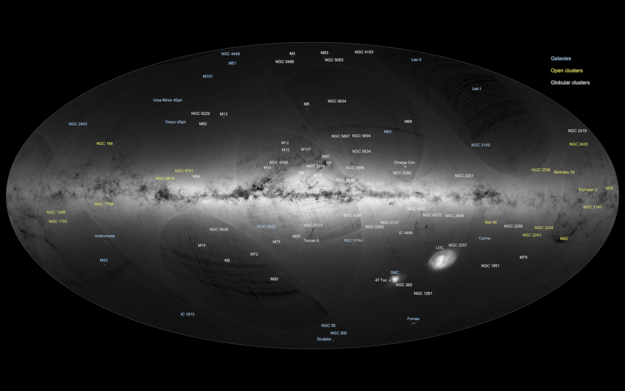 “The beautiful map we are publishing today shows the density of stars measured by Gaia across the entire sky, and confirms that it collected superb data during its first year of operations,” says Timo Prusti, Gaia project scientist at ESA. The stripes and other artefacts in the image reflect how Gaia scans the sky, and will gradually fade as more scans are made during the five-year mission. “The satellite is working well and we have demonstrated that it is possible to handle the analysis of a billion stars. Although the current data are preliminary, we wanted to make them available for the astronomical community to use as soon as possible,” adds Dr Prusti. Transforming the raw information into useful and reliable stellar positions to a level of accuracy never possible before is an extremely complex procedure, entrusted to a pan-European collaboration of about 450 scientists and software engineers: the Gaia Data Processing and Analysis Consortium, or DPAC. “Today’s release is the result of a painstaking collaborative work over the past decade,” says Anthony Brown from Leiden University in the Netherlands, and consortium chair. In addition to processing the full billion-star catalogue, the scientists looked in detail at the roughly two million stars in common between Gaia’s first year and the earlier Hipparcos and Tycho-2 Catalogues, both derived from ESA’s Hipparcos mission, which charted the sky more than two decades ago. By combining Gaia data with information from these less precise catalogues, it was possible to start disentangling the effects of ‘parallax’ and ‘proper motion’ even from the first year of observations only. Parallax is a small motion in the apparent position of a star caused by Earth’s yearly revolution around the Sun and depends on a star’s distance from us, while proper motion is due to the physical movement of stars through the Galaxy. In this way, the scientists were able to estimate distances and motions for the two million stars spread across the sky in the combined Tycho–Gaia Astrometric Solution, or TGAS. This new catalogue is twice as precise and contains almost 20 times as many stars as the previous definitive reference for astrometry, the Hipparcos Catalogue. As part of their work in validating the catalogue, DPAC scientists have conducted a study of open stellar clusters – groups of relatively young stars that were born together – that clearly demonstrates the improvement enabled by the new data. “With Hipparcos, we could only analyse the 3D structure and dynamics of stars in the Hyades, the nearest open cluster to the Sun, and measure distances for about 80 clusters up to 1600 light-years from us,” says Antonella Vallenari from the Istituto Nazionale di Astrofisica (INAF) and the Astronomical Observatory of Padua, Italy. “But with Gaia’s first data, it is now possible to measure the distances and motions of stars in about 400 clusters up to 4800 light-years away. Many more stellar clusters will be discovered and analysed in even greater detail with the extraordinary data that Gaia continues to collect and that will be released in the coming years. The new stellar census also contains 3194 variable stars, stars that rhythmically swell and shrink in size, leading to periodic brightness changes. Many of the variables seen by Gaia are in the Large Magellanic Cloud, one of our galactic neighbours, a region that was scanned repeatedly during the first month of observations, allowing accurate measurement of their changing brightness. Details about the brightness variations of these stars, 386 of which are new discoveries, are published as part of today’s release, along with a first study to test the potential of the data. “Variable stars like Cepheids and RR Lyraes are valuable indicators of cosmic distances,” explains Gisella Clementini from INAF and the Astronomical Observatory of Bologna, Italy. This is possible because some kinds of variable stars are special. For example, in the case of Cepheid stars, the brighter they are intrinsically, the slower their brightness variations. The same is true for RR Lyraes when observed in infrared light. 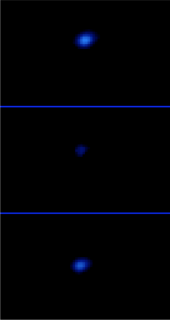 The variability pattern is easy to measure and can be combined with the apparent brightness of a star to infer its true brightness. This is where Gaia steps in: in the future, scientists will be able to determine very accurate distances to a large sample of variable stars via Gaia’s measurements of parallaxes. With those, they will calibrate and improve the relation between the period and brightness of these stars, and apply it to measure distances beyond our Galaxy. A preliminary application of data from the TGAS looks very promising. “This is only the beginning: we measured the distance to the Large Magellanic Cloud to test the quality of the data, and we got a sneak preview of the dramatic improvements that Gaia will soon bring to our understanding of cosmic distances,” adds Dr Clementini. Knowing the positions and motions of stars in the sky to astonishing precision is a fundamental part of studying the properties and past history of the Milky Way and to measure distances to stars and galaxies, but also has a variety of applications closer to home – for example, in the Solar System. In July, Pluto passed in front of a distant, faint star, offering a rare chance to study the atmosphere of the dwarf planet as the star gradually disappeared and then reappeared behind Pluto. This stellar occultation was visible only from a narrow strip stretching across Europe, similar to the totality path that a solar eclipse lays down on our planet’s surface. Precise knowledge of the star’s position was crucial to point telescopes on Earth, so the exceptional early release of the Gaia position for this star, which was 10 times more precise than previously available, was instrumental to the successful monitoring of this rare event. Early results hint at a pause in the puzzling pressure rise of Pluto’s tenuous atmosphere, something that has been recorded since 1988 in spite of the dwarf planet moving away from the Sun, which would suggest a drop in pressure due to cooling of the atmosphere. “These three examples demonstrate how Gaia’s present and future data will revolutionise all areas of astronomy, allowing us to investigate our place in the Universe, from our local neighbourhood, the Solar System, to Galactic and even grander, cosmological scales,” explains Dr Brown. This first data release shows that the mission is on track to achieve its ultimate goal: charting the positions, distances, and motions of one billion stars – about 1% of the Milky Way’s stellar content – in three dimensions to unprecedented accuracy. “The road to today has not been without obstacles: Gaia encountered a number of technical challenges and it has taken an extensive collaborative effort to learn how to deal with them,” says Fred Jansen, Gaia mission manager at ESA. The content of this first release was presented today during a media briefing at ESA’s European Space Astronomy Centre (ESAC) in Villanueva de la Cañada, Madrid, Spain. Fifteen scientific papers describing the data contained in the release and their validation process will appear in a special issue of Astronomy & Astrophysics. 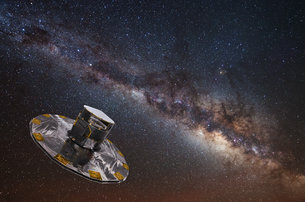 Gaia is an ESA mission to survey one billion stars in our Galaxy and local galactic neighbourhood in order to build the most precise 3D map of the Milky Way and answer questions about its structure, origin and evolution. A large pan-European team of expert scientists and software developers, the Data Processing and Analysis Consortium, located in and funded by many ESA member states, is responsible for the processing and validation of Gaia’s data, with the final objective of producing the Gaia Catalogue. Scientific exploitation of the data will only take place once they are openly released to the community. Members of the consortium come from 20 European countries (Austria, Belgium, Czech Republic, Denmark, Estonia, Finland, France, Germany, Greece, Hungary, Ireland, Italy, Netherlands, Poland, Portugal, Slovenia, Spain, Switzerland, Sweden and the UK) as well as from further afield (Algeria, Brazil, Israel and the US). In addition, ESA makes a significant contribution to the consortium in the form of the Data Processing Centre at ESAC, which, among other tasks and responsibilities, acts as the central hub for all Gaia data processing. Dette indlæg blev udgivet i Uncategorized og tagget esa. Bogmærk permalinket. Centauri Dreams Blog om den nyeste tekniske udvikling indenfor højhastigheds fremdrift og lang leve tid i elektronik mv. Natturligvis må denne side henvise til lightspeedmagazine Lightspeed is a science fiction and fantasy magazine. the Starship Reckless is dedicated to writing and discussing science, science fiction, fantasy and the shared borders between them. Tina Ibsen astrofysiker Blog på videnskab.dk Blog med fokus på den europæiske rumfartssektor og særlig på det europæiske rumagentur ESA.